Traveling in a 38 foot coach we stayed 3 nights in a site for big rigs. 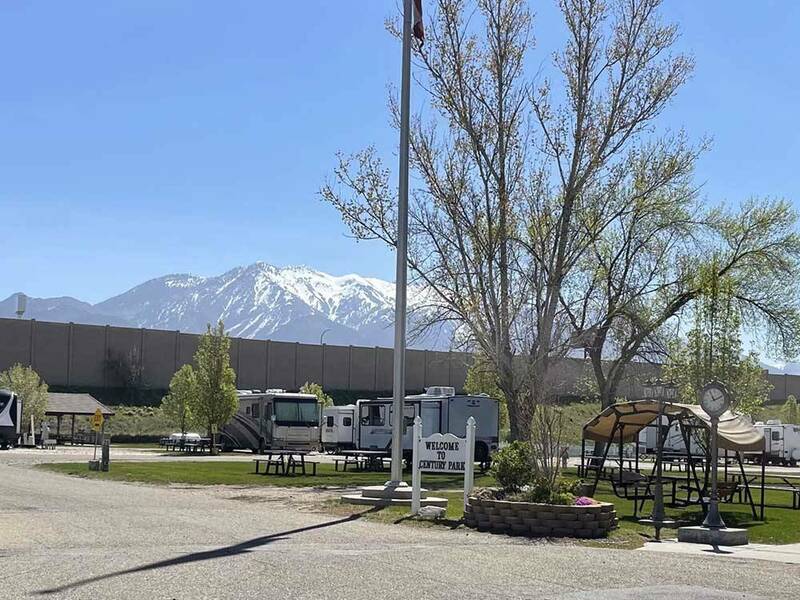 One side of the rv park has long-term tenets and the other side has overnighters. Long term tenets area is very clean... the entire park is very clean. If you check out google aerial map you will see that this is a very big park and kids have a big grassy area to play. Our site had three different locations where our sewer line could drain. They have paved and gravel sites. Staff is pleasant and very accommodating. If you are looking for a quiet and clean park where you can sit outside and relax… go here. We enjoyed our stay, and would go back. If you have a dog there is ample area to walk your pet. We have stayed here on two different trips and would stay here again. The restrooms are older, but very well maintained and very clean. There are 6 individual shower stalls in he womens bathroom and lots of counter space to dry your hair. The pull through sites are nice and level for easy set up. However, they are kind of narrow. One of our neighbors awning was up against our fifth wheel. The folks on the other side had their sewer hose almost at our door. We stay here because we visit family in S. Weber, so we spend very little time in the park during the day. They have added sport courts and additional picnic area that were very nice and they have a large very nice dog park. There is also a swimming pool and hot tub that are really well maintained. Wonderful staff. We will stay again next year. The only reason I did not give this a 5 star was because it is a bit noisy. You are right off I-84. There is a big cement wall but you still get traffic noise. Very clean, nice concrete pads. We had a pull through and did not even need to unhook our tow car. Everything else was really good, friendly greeting. This park is conveniently situated directly off the interstate but is surprisingly buffered from highway noise. The sights are fine, nothing special, and the bathrooms are definitely not special. Best part of this park is the location. New concrete pull thru sites. Very nice stop for an overnight stay. Near the highway, but sound walls keep out the noise. Friendly staff. We did not use the restrooms or laundry, so I can't comment on those. Will stay here again if passing thru Utah. This is the fourth stay in a RV park. Sadly we found that available parks off I-80 are scarce. At least in March. The ads or websites should be more defining particularly for newcomers. If there are set business hours then state them. If you have night depository check ins after hours, wonderful.. say so. If your hours are limited to 7a-7p say so on your site. It will save you unwanted calls and save potential customers' time. Sorry, I spent wasted time chasing RV parks for a space. Now for Century, it was easy to find, had late night self check in ( which I found out from the gas station attendant), nice spaces, and a dump station at each space! The downside was the shower room... Small spaces, not secured except via a shower curtain, and water that was very slow to heat up. Overall it met our needs well for an overnight stay. We stayed for only one night. The sites were gravel but level. We didn't have need of the laundry, restrooms, or use the pool, just the full service hook-ups. They did not offer free morning coffee and the dumpsters were quite far away from where we were put. They explained they were under new ownership and offered us a survey that included an opportunity to make suggestions. We explained that every other campground we stayed at offered at least free coffee, if not a continental breakfast, and suggested they place additional dumpsters at more convenient places throughout the campground. We hope they take our suggestions into consideration however, we would stay again. NEW sites are narrow and space in between is almost non existance. Awnings almost touch rig next to you. Also when they water, it gets all on your rig late at night then water spots. Owner is awesome, wants to do the right thing, but, may be too late for new sites. Perfect location for what we needed. Great pool and hot tub area. Only 5min from the 25th st district. We found this park on Good Sam and liked that it was right next to the interstate. There was a gas station nearby also. the park is clean and they appear to be doing some updating of the sites. Most of the sites are gravel but very level and clean, plenty of room for a large 5ver. Will surely stay here again on the way South in the fall. 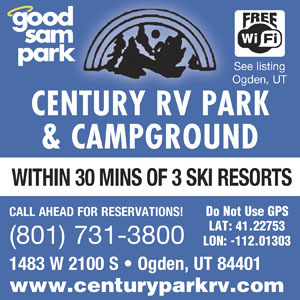 I had vehicle problems in Ogden, Ut and stayed in this park for three days. It was a very well kept park and close to freeway access. They were very nice and helpful during my stay. I would definitely stay there again. We found this park using the Good Sam Club trip planner. The office staff member was very friendly when I called to make a reservation and the office staff were friendly when I checked in. The park has easy interstate access and a friendly environment. Will definitely stay here again!